Simple Cabbage Salad | Simple and Delicious ! You may think whats special in this "recipe"? For me and my family this is very important. My little veggie haters LOVE this one! During school and college days, this was the one saved me from taking the curries which I don't like.Still I crave for it some days! For those who love spicy and sour food,with or without cabbage, this is a good option for you to take with rice.. 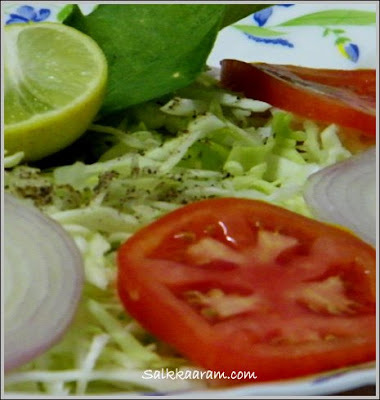 This salad is also a good accompaniment with chapati and chicken fry! Chop cabbage finely. Chop onion and tomato too. Very thin slices are good. Mix all with chopped green chilly, salt, lemon juice and pepper powder. Nice,It is simple also. I shall test it. 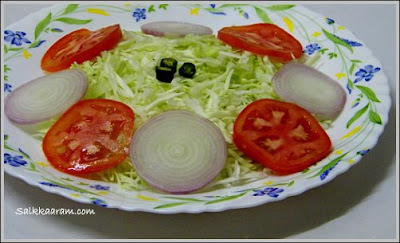 Thats very simple and delicious salad, my mom too makes it the same way.. Simple ones are always are the best. Thats so simple! :) thanks for sharing such simple recipes. Salad with anything I am ready to have it! I think I'd want mine with rice. i watched your blogg every day. i tried many recepies from it. it was wonderful!